Canon has announced an upcoming 'major' firmware update to their flagship APS-C camera, the 18 MP, dual Digic IV equipped, EOS 7D. The firmware Version 2, will include a raft of new features to further enhance the capabilities of this great camera, the best DSLR value in today's camera lineup, in my opinion. IMPROVED RAW MAXIMUM BURST - In the EOS 7D, the maximum burst of RAW file frames was 15 – with the firmware update this will be significantly increased so that the camera’s buffer will handle up to 26 RAW frames in a continuous burst. IN-CAMERA RAW CONVERSION - The EOS 7D will allow for in-camera post-processing of images. RAW images can be edited in-camera and options can be changed before saving the finished file as a ready-to-print JPEG or for sending wirelessly. This function can be used with full resolution RAW files, but not with M-RAW or S-RAW files. The settings for in-camera RAW processing include White balance, Picture Style, High ISO speed noise reduction, Colour Space, and lens data corrections (Peripheral Illumination Correction, distortion correction and Chromatic Aberration Correction). IMAGE RATING CAPABILITIES - Like other Canon EOS DSLRs, such as the EOS 60D, EOS-1D X and EOS 5D Mark III, the EOS 7D will be able to rate images from 1 to 5 stars in-camera for quicker and easier sorting of images within your workflow. The ratings can be used to sort images in applications such as Adobe Elements, Adobe Bridge and Apple Aperture. The ratings are XMP compliant and Canon’s Digital Photo Professional software has been updated to reflect this. AUTO ISO MAXIMUM SETTING - Within the EOS 7D’s shooting menu photographers will have the ability to set a maximum ISO speed for ISO Auto, within the ISO range of 400-6400, so that you can minimise the amount of noise in your images. MANUAL ADJUSTMENT FOR AUDIO RECORDING LEVELS - During EOS Movie shooting you will be able to manually adjust the audio recording levels to one of 64 levels, whilst the sound volume during playback can be set to one of 11 levels. During movie recording noise from the aperture is reduced and the camera also has an automatic wind cut filter. JPEG RESIZING - Within the camera’s image-recording menu with all JPEG images you will be able to resize the image (for image downsizing) and save it as a new image. Note that the aspect ratio cannot be changed. SUPPORT FOR THE GP-E2 GPS UNIT - The GP-E2 unit arrived with the EOS 5D Mark III and this firmware update will enable the GPS unit to be used with the EOS 7D, via a cable connection, so that photographers can geo-tag images with latitude and longitude data in the EXIF fields. QUICK CONTROL DURING PLAYBACK - With the Quick Control (Q) button pressed during image playback photographers will be able to select options for protect images, rotate images, rate images, resize images, highlight alert, AF point display and image jump. FILE NAME SETTING - In the EOS 7D’s camera settings menu in user setting 1 the first four characters of the file name can be adjusted, whilst in user setting 2 the first three characters of the file name can be adjusted and the fourth will be set automatically according to the recording quality. TIME ZONE SETTING - Within the EOS 7D’s camera settings menu you will be able to set the time zone, plus daylight saving time can also be set. FASTER SCROLLING OF MAGNIFIED IMAGES - The screen scrolling speed will be faster for scrolling through images when they are enlarged. The ease of use is improved when using the camera to zoom in and check focus. The existing impressive specifications of the EOS 7D include up to 8fps shooting speed, high ISO sensitivity up to 12,800 for low light shooting, an iFCL metering system with a 63-zone Dual-layer Metering Sensor for superbly accurate exposures, plus outstanding in-camera Speedlite Transmitter flash technology. 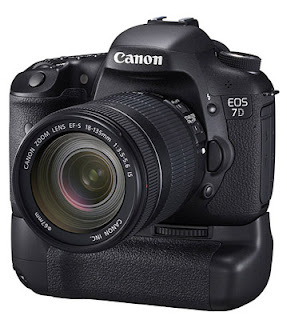 Take a look at my post analyzing the Canon EOS 7D and why I think it is an excellent camera for the money. Visit my website MichaelDanielHo.com to see my Equipment bag and see exciting Travel and Wildlife photos from around the world, taken with the 7D and other equipment. Subscribe to my Blog and follow me on Facebook to get the latest Photography news.